If I was a doctor (other than a Doctor of Love that is), I’d be one of those self-help know-it-all types like Dr. Oz, ugh, and when someone came to me with a problem, like an in-grown toenail, or a eye twitch that began when those economy birds flew South, I’d recommend this for the pain: Take two Georgette Heyer pills and call me in the morning. As I continue up her ladder of Regency romance novels, I swear this woman is the magic tonic that cures all ills. Sorry if I’m gushing all over the computer screen here (and yes my tears of joy squirt outward instead of downward), but I love these books! They’re like discovering a newer version of Mr. Darcy and Elizabeth Bennett, Capt. Wentworth and Anne, or Emma and Mr. Knightley, all over again. Right down to the food, the dress, the society, and even the arched eyebrow! In the Devil’s Cub and The Grand Sophy, Heyer has once again nailed down the perfect hero and heroine. The story’s themselves are unrelated, not even taking place in the same time period, but the plots are so well-written I didn’t even care that it once again remained the same: a strong, witty female enters the picture, she unknowingly attracts the unwilling alpha male - in one case shooting him, he of course falls in love with her because of it, an entanglement occurs, then somehow they end up together on the last few pages and you are left sighing and turning over the air to find out what happens. I’m discovering that Heyer was a master of the cliff-hanger. It must’ve been her own private joke, leaving you salivating for more at the end of every book. Chick fic! i think i'm getting a stomach-ache. You got it baby! You know you like it - secretly. Come on, admit it! my wife's the chick-fic expert at the house (think Nora Roberts, Johanna Lindsey, etc. ), and she's never heard of Georgette Heyer. This wouldn't be some of them thar "highbrow literature" Amanda-type stuff, would it? 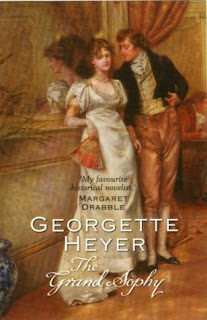 It seems everyone on the blogosphere has gone crazy for Georgette Heyer lately. I'll have to check her out. I promise nobody says that word in these books. It's like easy Jane Austen, you know without the word thither. 'pshaw' is a good word. so is 'thither', unless one is drunk. 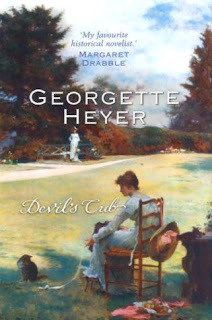 Happened to pass by and since i love Georgette Heyer's books (almost all of the romances anyway) and been reading them for years since i was a kid, couldn't resist posting a bit on her. Heyer basically invented historical romances (Jane Austen's Pride and Prejudice was contemporary). She also invented what we now know call 'Regency romances'.